Quick convertible. 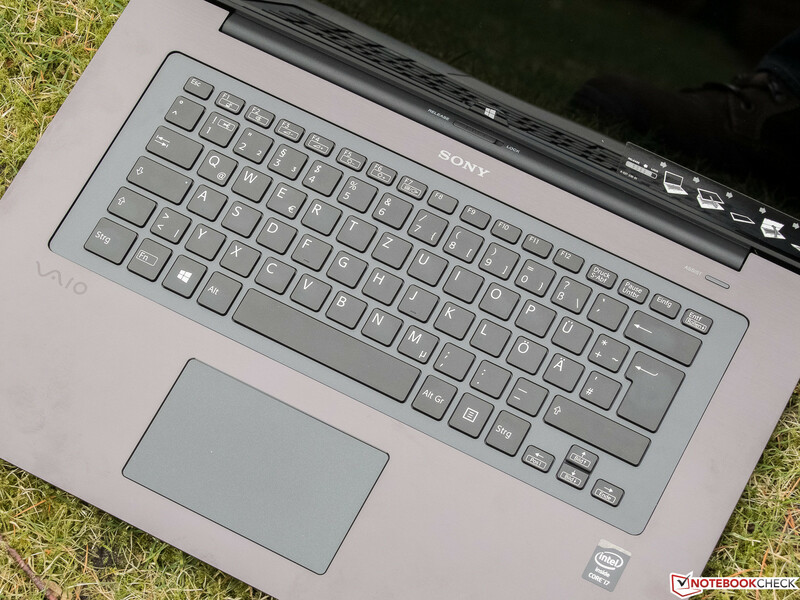 Sony has come up with an innovative construction that allows converting a laptop into a tablet quickly. 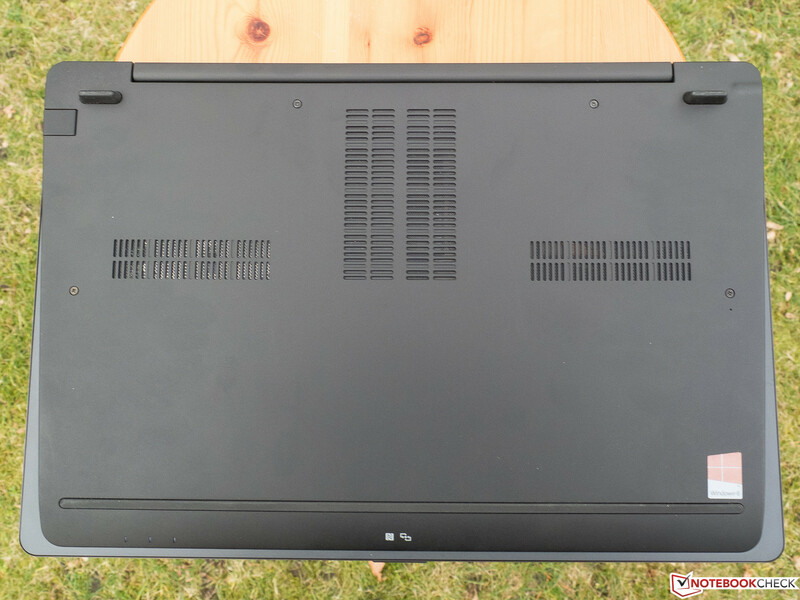 Besides the review sample's unusually high resolution of 2880x1620 pixels, particularly its size of 15.5 inches stands out, as that is actually incompatible with its use as a portable tablet. Successful hybrid or Hughes H-4 Hercules? 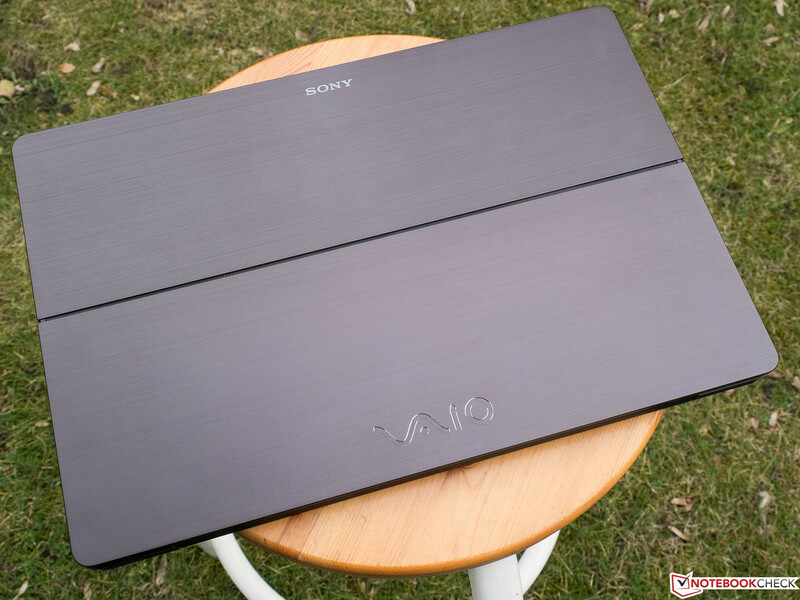 The reviewer was a bit astonished that Sony has now complemented its Vaio Fit multi-flip convertible line with a 15.5-inch model. What use is such a big and heavy tablet (2.3 kg; ~5.1 pounds)? 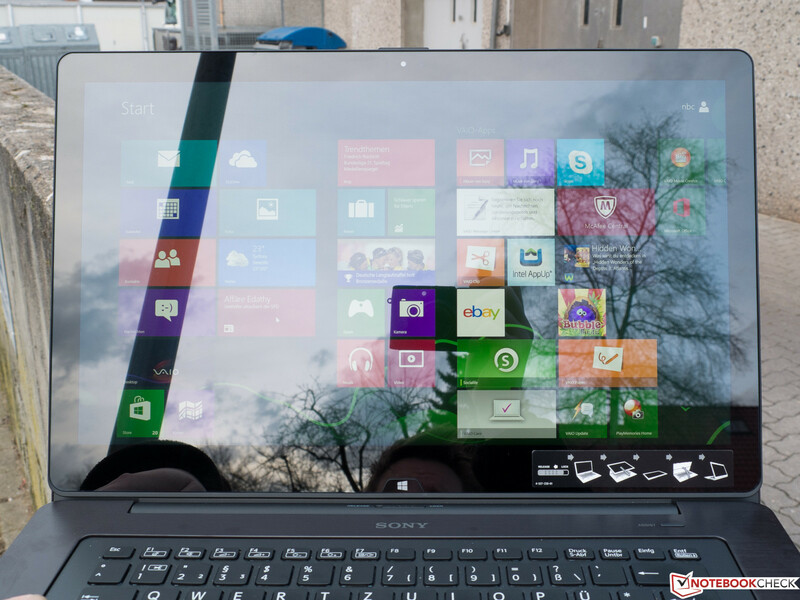 The answer is found in Windows 8, the extreme-resolution touchscreen, and the included stylus. 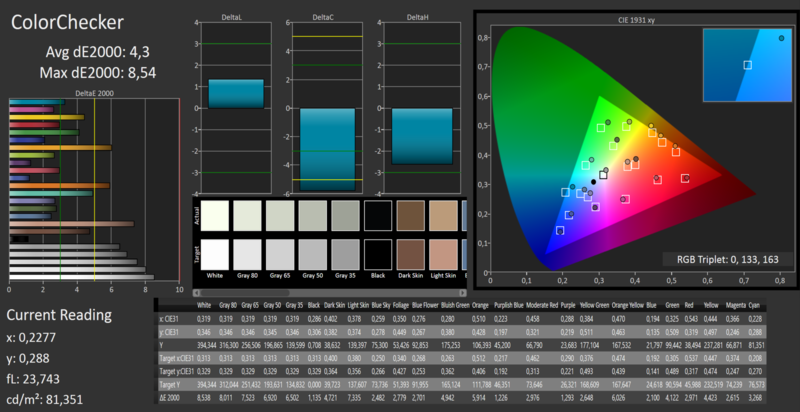 This combination - naturally alongside the matching software - could make Sony's device interesting for graphic designers. That is, providing a limited color space does not matter. Its alternative use as a stationary family tablet also makes a lot of sense. 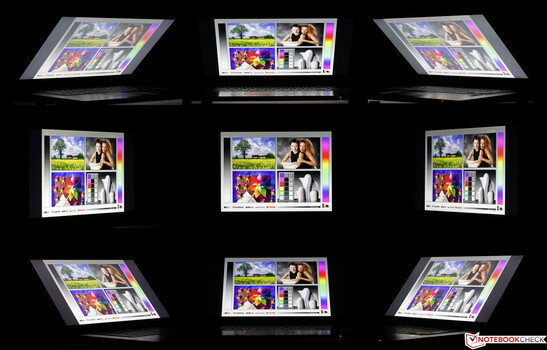 Moreover, when used as a laptop, there is no need to discuss the advantages of a large, high-resolution screen anyway. The presentation mode also benefits from a large screen. Users who prefer smaller and more portable devices might find something among the differently configured 13- or 14-inch convertibles in the line, such as the Sony Vaio Fit 13A Multi-Flip SV-F13N1L2E/S. In any event, Intel's Core i7 CPU, a dedicated Nvidia graphics, and a high-capacity working memory provide enough power. 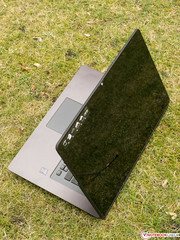 The convertible ultrabook should barely ever find its limits in the intended application fields. 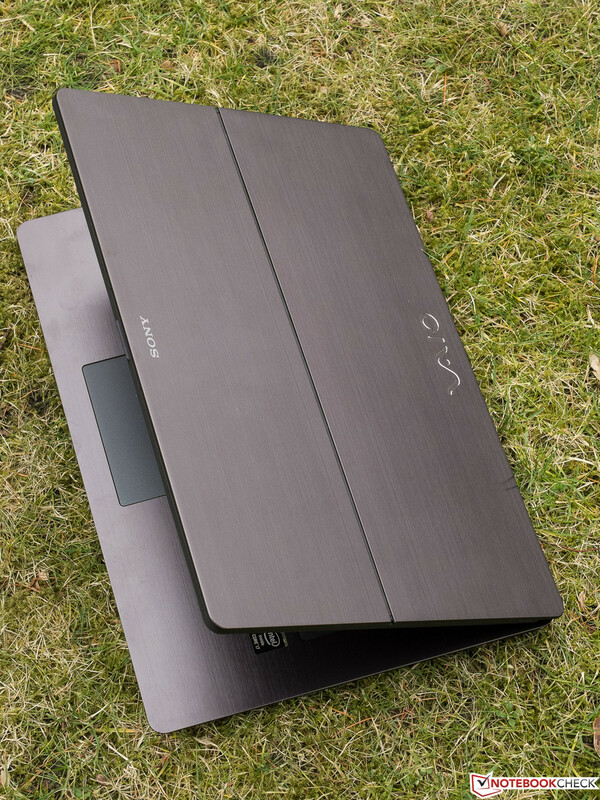 Despite the different sizes, Sony's Vaio Fit multi-flip SV-F15N1Z2E/B directly competes with the functionally comparable products of other manufacturers. 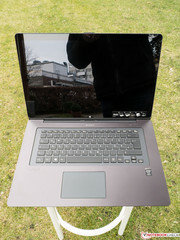 For example, the 13-inch Asus Taichi 31-CX003H, which is also a convertible ultrabook whose back-to-back screens both(!) feature a resolution of 1920x1080 pixels, and which is powered by an Intel Core i5-3317U from the former Ivy Bridge generation. 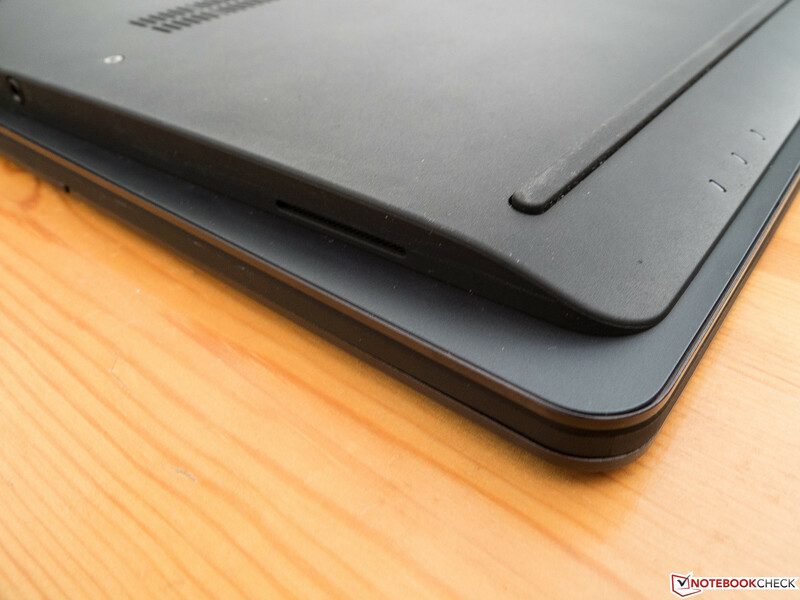 We used the Lenovo Yoga 2 Pro as a second device for comparison. 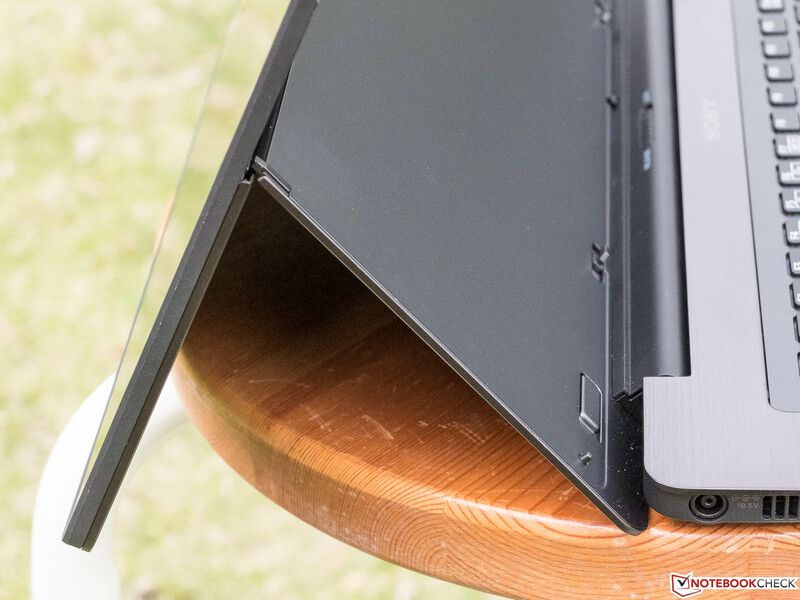 Its screen can be tilted by 360° so that the keyboard is on the tablet's underside. The resolution of this 13-inch device is gigantic, and perhaps senseless at 3200x1800 pixels (276 ppi). 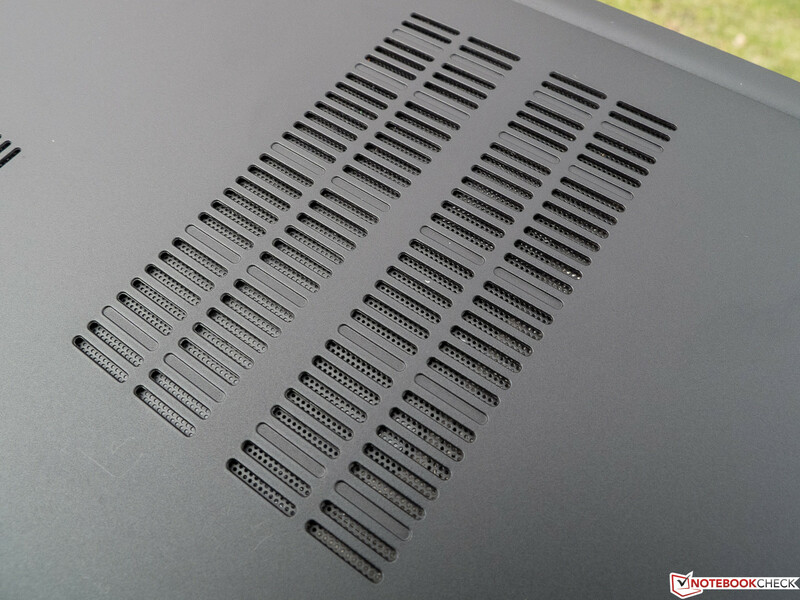 The resolution behemoth relies on Intel's Core i5-4200U Haswell ULV CPU. In terms of price, the three contenders were within the same price range of 1300 to 1500 Euros (~$1786 to $2060). However, since the Taichi has been in retail since the spring of 2013, it is now already available for approximately 1000 Euros (~$1374). 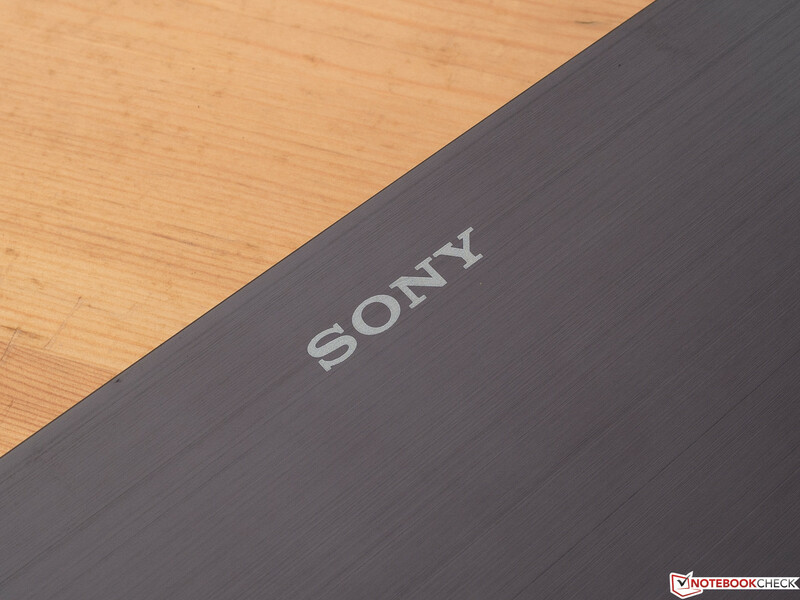 Our in-depth review will uncover whether the form factor, weight, and convertible claim of our Sony are in line, or if it is just a too big and heavy version of the 13-inch devices from the same product line. The casing's main color is difficult to describe as it changes from dark brown to a kind of purple depending on the ambient light. The upper side of the base and the lid's back look like brushed metal, and are very susceptible to fingerprints. 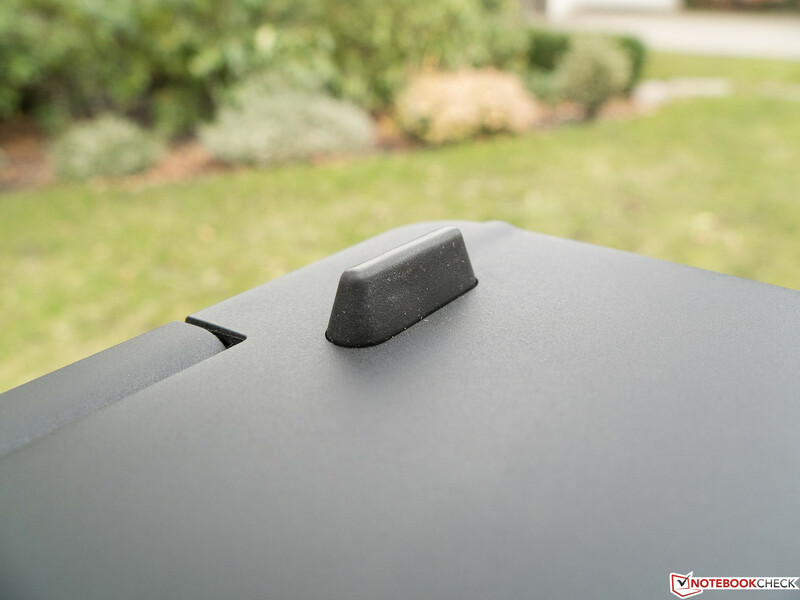 The touchpad and keyboard bed are made in a plain, dark gray, and light matte plastic. The plastic on the underside is black and non-slip. The unusually high rubber stoppers are striking. They are likely to ensure sufficient air intake from underneath. 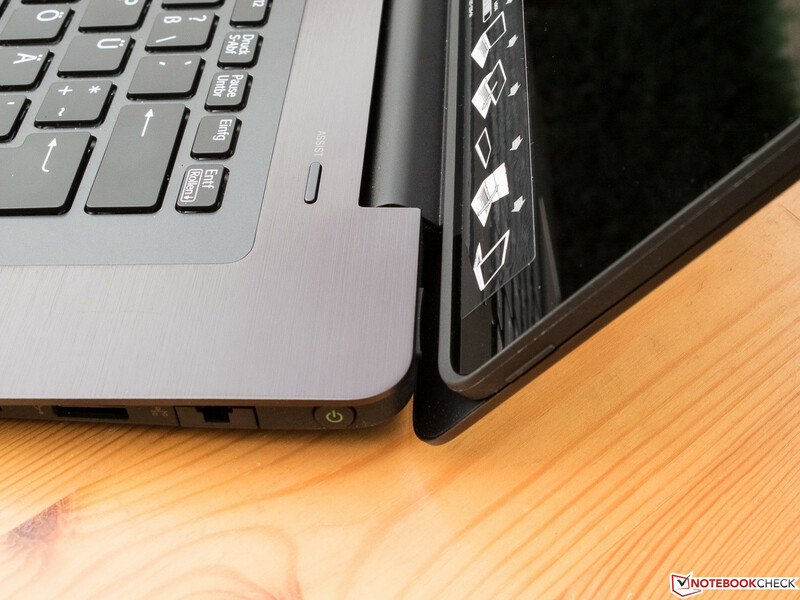 According to ultrabook specifications, the stoppers are not part of the total height. Our Sony would have otherwise clearly surpassed the maximum allowed 23 mm (~0.9 inches). 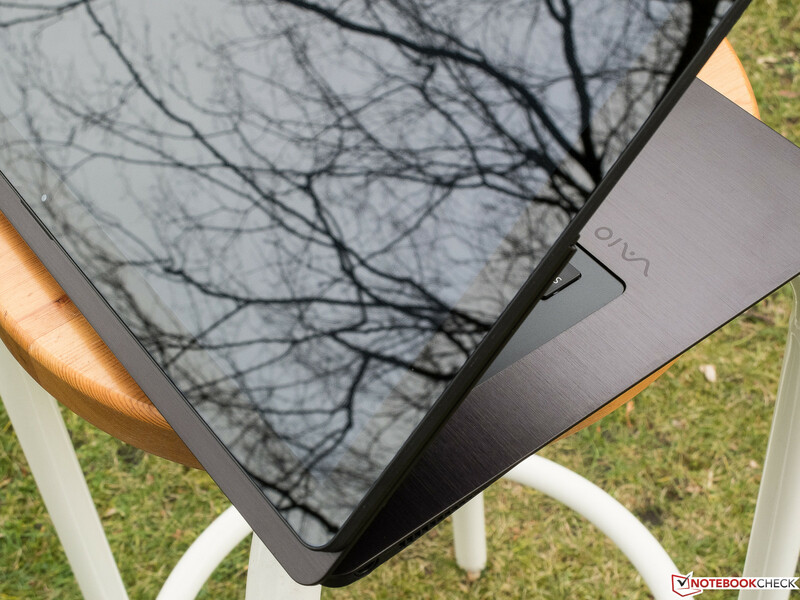 The display's bezel is glossy black with a raised edge. The base does not make a very rigid impression. It warps easily, and produces disturbing noises. In return, the mechanism that transforms the device into a kind of tablet makes a solid impression. However, care is needed when reconverting it into a laptop so that the screen's edge does not scrape over the keyboard. It is not quite a genuine tablet; the uneven build with many gaps, corners and edges, and the dominant wedge shape contradict that. This barely has any drawbacks in use when using it on the lap and the convertible is much too heavy to hold for a long time anyway. There is the standard variety of interfaces, but not more. At least an Ethernet port is installed that has to be pulled out before use, which fits more with the stationary character of Sony's convertible. Adapters are not needed for the other ports either. The ports on the left are centered, and plugged in cords or sticks could get in the way. The right-handed interfaces are located in the back, where the (main) on/off button also is. 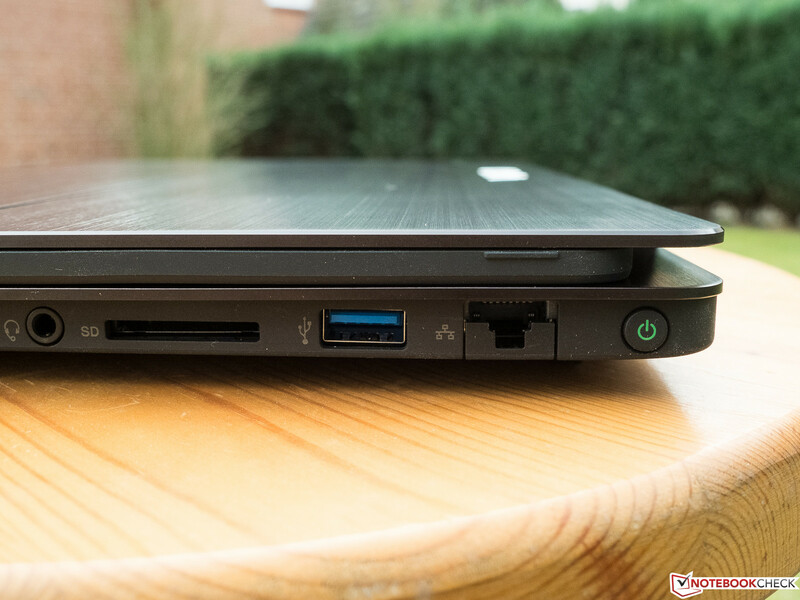 As typical, of slim ultrabooks, there are no special ports like a DisplayPort or eSATA. Either Sony lacked the will or the room for a VGA out that is still significant in the business sector. Now we have to unfortunately deal with a yet unseen ergonomic blunder. We do not know whether Sony expects buyers of the convertible to use it on an illuminated mirror and repeatedly perform acrobatic feats. However, we cannot explain why all the ports are covered by the base's protruding upper part on both sides, and thus cannot be seen or felt adequately and most certainly cannot be used comfortably. The resulting and recurrent groping is simply an imposition that could have been avoided had the base tray been extended so that it closes flush with the base's upper side. This also looks unsightly to the author, and consequently leads to a point deduction in Connectivity. In addition to Realtek's RTL8168/8111 Gigabit LAN chip, the review sample sports Intel's Wireless N 7260 module that takes care of wireless communication. Besides the often-busy 2.4 GHz band, especially found in office buildings with many companies and in city centers, it also supports the less loaded 5 GHz band. Bluetooth 4.0 + HS is also available. The, until now, short range NFC mostly found in smartphones and tablets is also installed. The corresponding label is located opposite the Windows button on the underside. A test with the Nexus 4 showed that although the devices were identified, transferring a website from the Nexus to the ultrabook failed with a message that the devices should be placed beside each other again. However, this was not successful; here, some work on the compatibility is likely needed. Perhaps the announced upgrade to Windows 8.1 will improve things. As to the Wi-Fi reception performance, the Sony device made an above average impression in the author's individual test setup. The transmission performance was not at all impaired when a large file was downloaded at a distance of almost 10 meters (~33 feet) and through two brick walls. Next, the tester went down the stairs of an apartment building, moving away from the router. Although the transmission rate clearly dropped, the decrease was relatively moderate, and the connection was kept right up to the front door (on the other side of the building). Only a few devices have managed that until now. The last one notably sported the same wireless module. We could not find any accessories specially designed for the SV-F15N1Z2E/B by Sony. The included accessories are limited to a few startup and troubleshooting guides, safety guidelines and the stylus along with the (AAAA) battery. Users who want to maintain the guarantee and warranty claims, and do not open the device, will not be able to access the innards due to the lack of maintenance covers. It is not even possible to replace the battery. 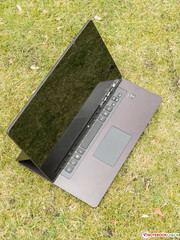 This user-unfriendly and environmentally harmful policy is currently becoming more and more popular among ultrabooks, and unfortunately, is also infecting conventional laptops. The manufacturers' putative reasons do not deserve attention. They are simply excuses to hide the fact that the sole concern is to make buyers dependent on the manufacturers' overpriced services. Sony includes a two-year warranty as standard, which can be upgraded for a charge. Details about standardized Extended Service Plans are listed when the product is added to the cart on Sony's website. 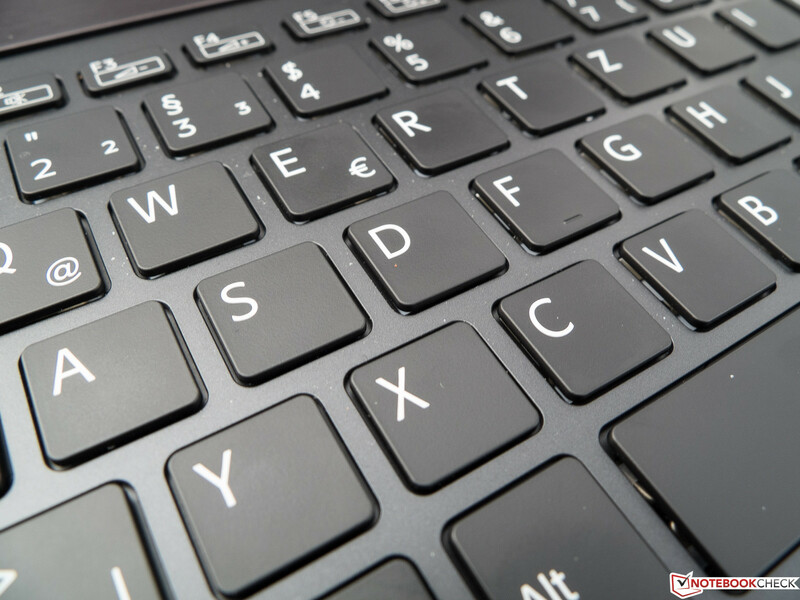 In our opinion, the keyboard's quality is unsatisfactory considering the ultrabook's steep price. This is not because the layout does not comply with the standard. Rather, it is the short key drop and unclear pressure point that are unnecessary for a device with this height. Together with the slightly spongy stroke, it provides vague feedback. The keyboard is made of a slightly cheap-looking plastic that yields under pressure. The keys are even and lightly roughened. The keyboard's backlight makes a very good impression, but it can only be turned on or off via a Sony tool because there is no hot key. It is too bad that the available space is not used for a number pad. 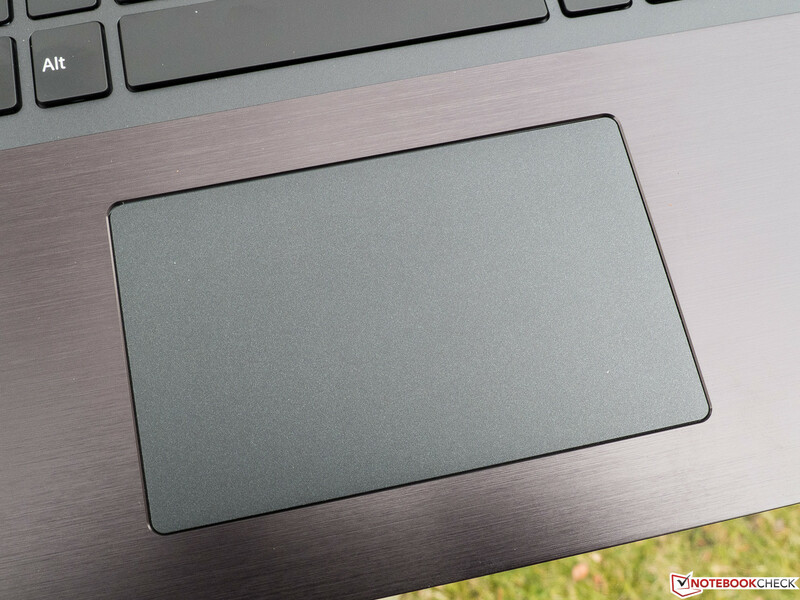 The touchpad is a ClickPad from Synaptics without dedicated buttons. The lightly roughened surface, which is not sensitive to its edges, provides a well-palpable feedback, but its area could have been a bit bigger - there would have been enough room. We deem the mouse buttons' drop adequate, the pressure point is crisp, and it provides a clearly audible feedback. Gestures using up to three fingers can be configured in the rather limited setup menu. 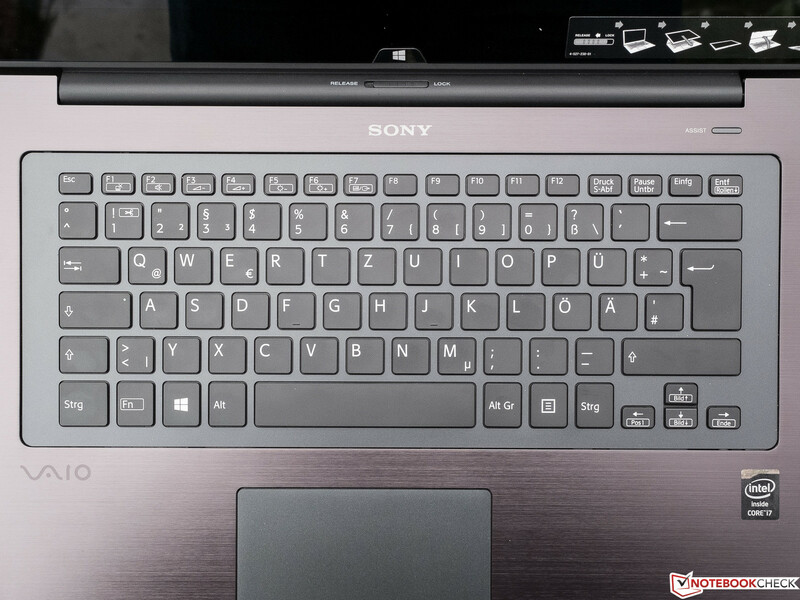 Like most current models, the touchscreen in Sony's Vaio Fit multi-flip SV-F15N1Z2E/B detects up to 10 points at the same time. We did not find reason for complaint in terms of responsiveness and accuracy. The included stylus achieved an almost pinpoint feedback on the screen. A slight delay was noticed in the writing test, but in return, even very quickly drawn lines were accomplished without interruptions. 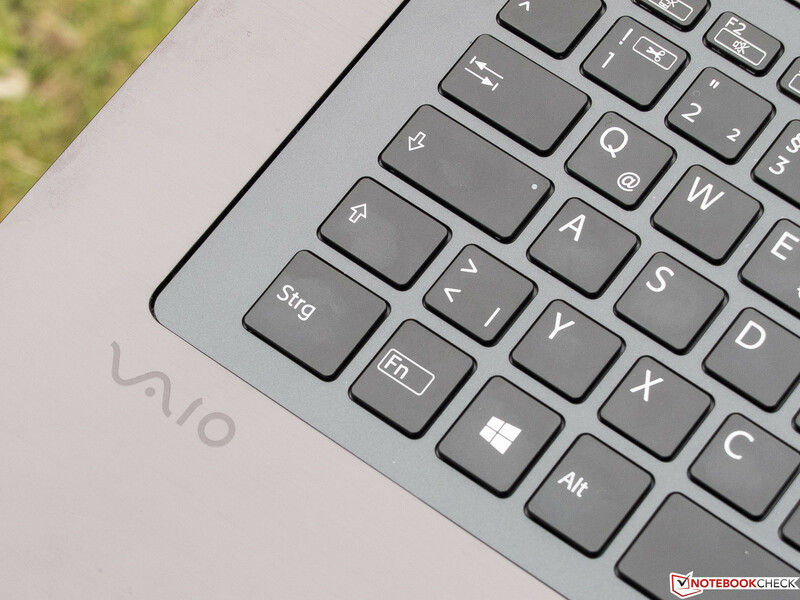 Unlike Sony's Vaio Fit 13A multi-flip SV-F13N1L2E/S, the sensor grid is barely visible to the naked eye, and will likely stay invisible in practical use. The QHD or Quad HD trend is consistently growing. The quadrupling is related to the pixel count in opposition to standard HD-ready (720p). However, the screen does not feature the standard QHD resolution of 2560x1440 pixels, but an even higher, more exotic 2880x1620 pixels. This is not wrong considering the screen's diagonal of 15.5 inches, as it results in an agreeably high pixel density of 213 ppi. That is more than the 188 ppi that the human eye with perfect eyesight can resolve at a typical distance of 45 cm (~17.7 inches). For comparison: A 15.6-inch screen achieves 141 ppi in a Full HD resolution (1920x1080 pixels); a small 13.3-inch QHD manages 221 ppi. 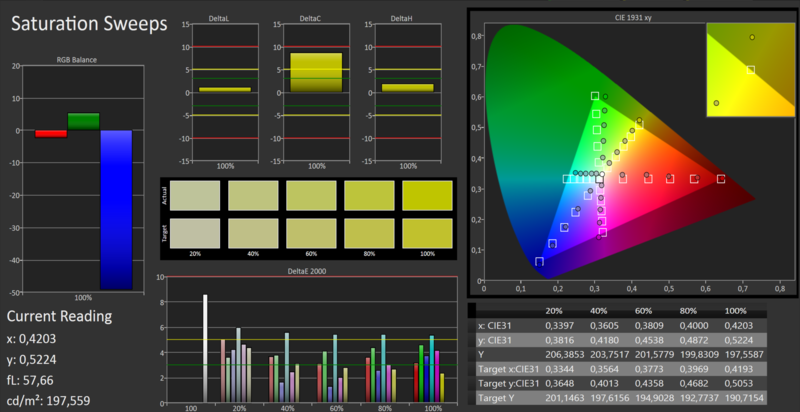 We could not ascertain a big difference with our naked eyes when the native resolution was reduced to Full HD. However, high native resolutions always have a positive impact when interpolating lower resolutions. An even finer image impression results since more pixels are available for interpolation. 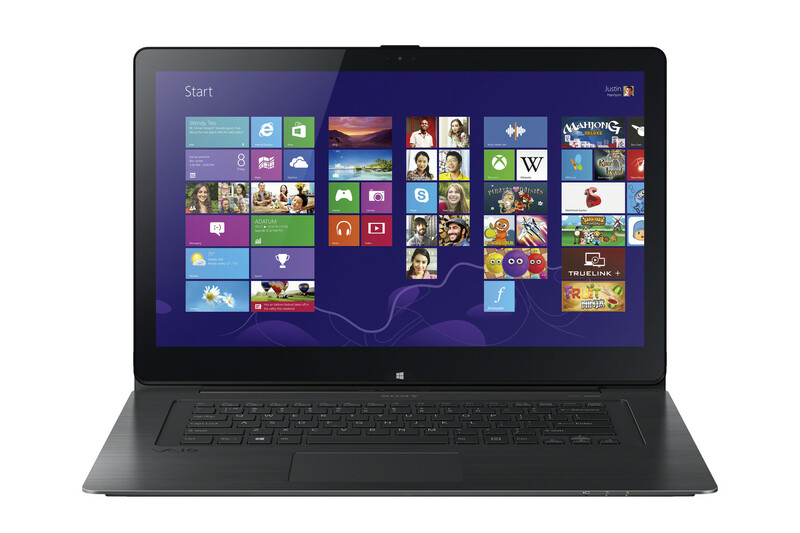 To avoid the common drawbacks of such high resolutions, in the form of tiny desktop elements or too small fonts, we would recommend the free upgrade from the pre-loaded Windows 8 to Windows 8.1 that provides more setting options, an automatic scaling of desktop icons and system fonts, as well as better scaling options for software developers. However, image errors are not uncommon even under Windows 8.1, particularly when using older software. A few of our benchmarks and tested games refused to start, or only started in full screen mode when we first set the desktop resolution to Full HD manually. The installed IPS screen proves responsible for the perfect focus, though not breathtaking contrast of 524:1 of the highly reflective display. 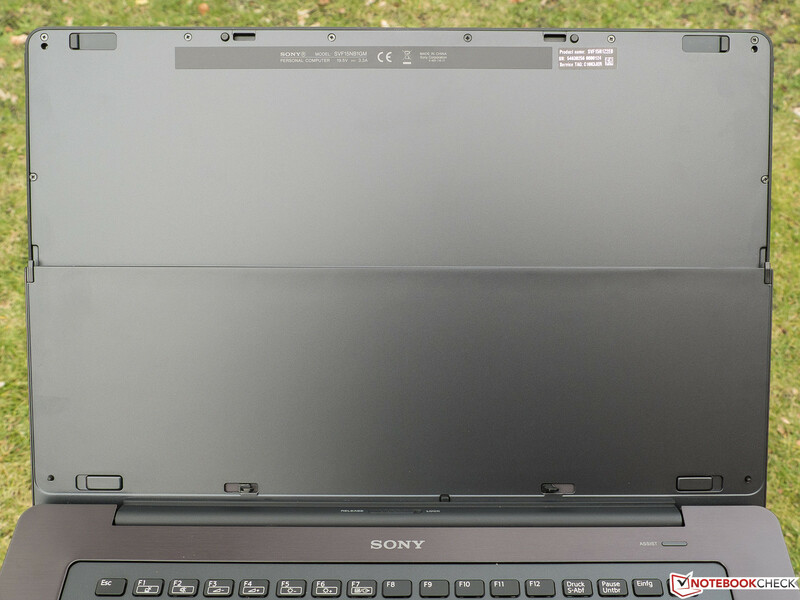 The screen in Sony's convertible reaps in a good rating up to here, considering its maximum brightness of over 370 cd/m² in the screen's center, which is maintained in battery mode, alongside the decent illumination of 89%. Matching the rather middling contrast for an IPS screen, and the equally not exemplary black value of 0.69 cd/m², black cannot really be called pitch black. However, this is barely noticed adversely in practical use. 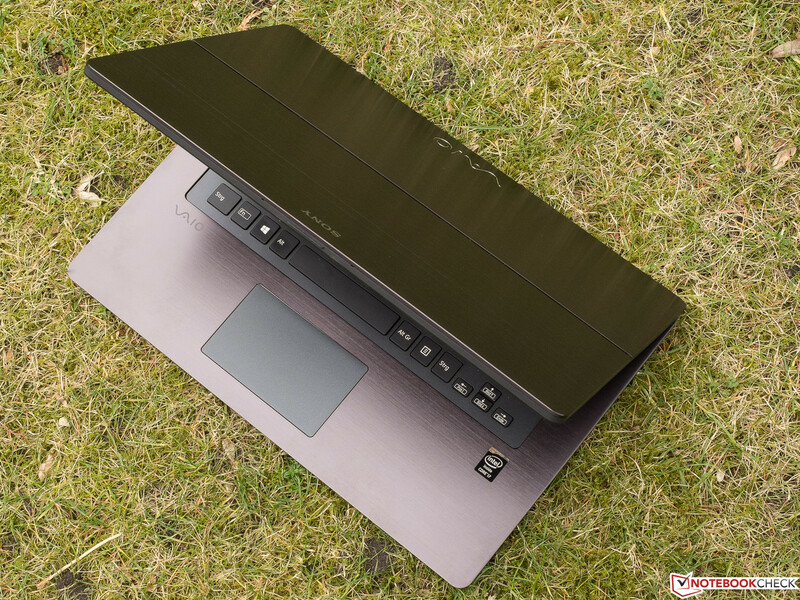 Lenovo's Yoga 2 Pro does no better in this regard, while the two-sided Asus Taichi 31 stands out in the field with an awesome contrast of 1275:1 alongside a black level of just 0.2 cd/m². However, it reveals a clear weakness in its maximum brightness of only 255 cd/m². There are currently only a few videos that exploit the review sample's high resolution. 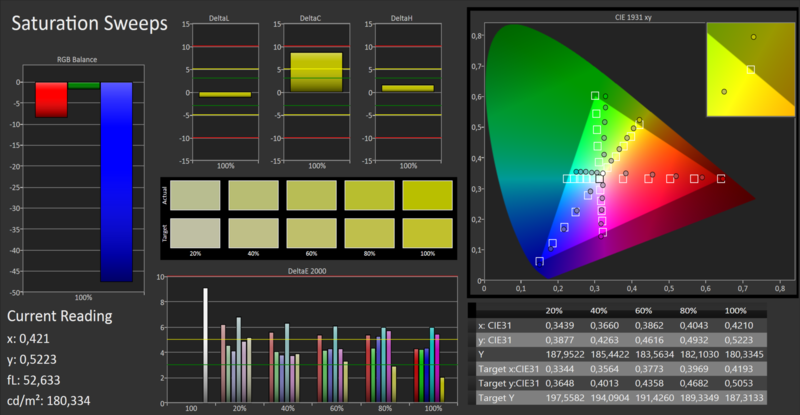 When up-scaling in the context of rendering a 1080p video, Sony's device exhibited a razor-sharp picture with subjectively beautiful, natural looking colors after successful calibration. 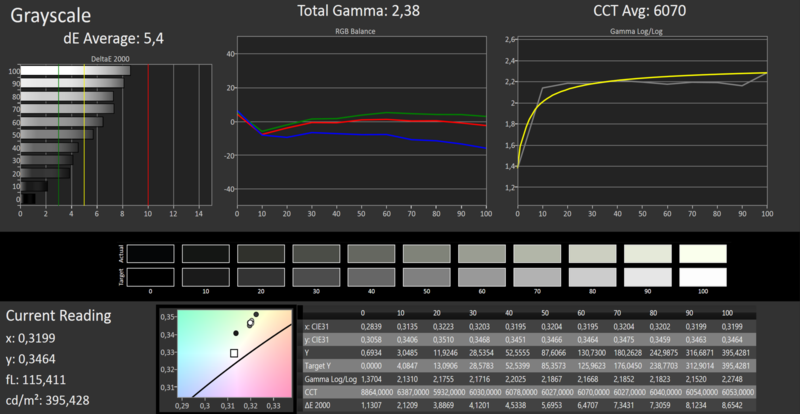 However, even when not calibrated, the sample's DeltaE rates of 5 (ColorChecker) and 6 (Grayscale) are still acceptable. The calibration only results in a minor improvement to 4 and 5. 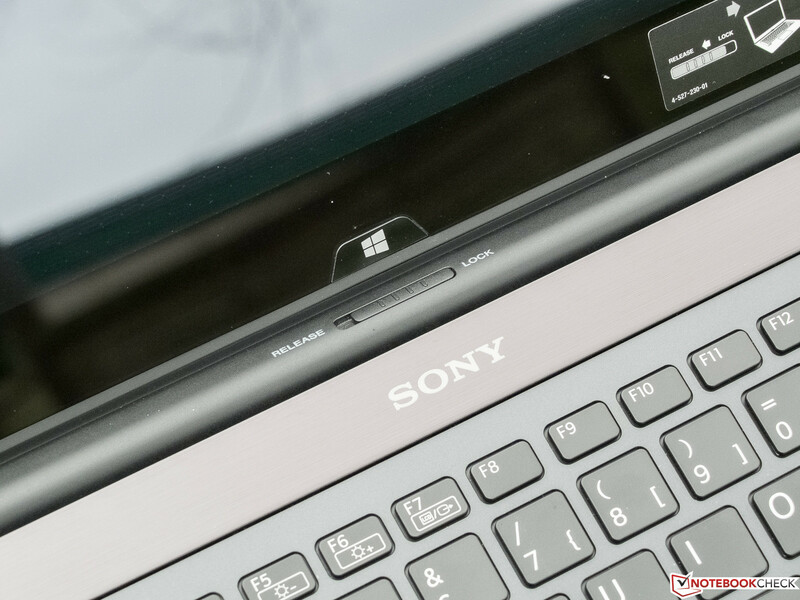 The frequently noticed bluish cast in many laptops is never an issue in Sony's device. Only a slight tendency of neutral gray toward a clay-colored olive green is significant. The color space coverage of the professional AdobeRGB color gamut is IPS-typical (laptop) 60%. High brightness or not, the screen is so highly reflective, even on a cloudy day, that it again proves: When something other than a dark area is reflected in the viewer's eye, reasonable use is virtually impossible. 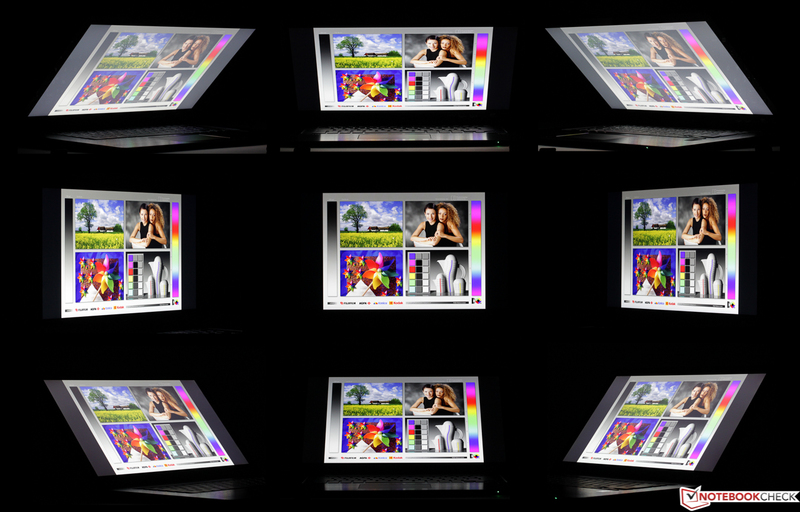 We would classify the viewing angle stability as slightly above average compared with other IPS screens. Color deviations were not noticed even from the smallest possible viewing angles, and the brightness loss was within limits. This screen is tolerant - just not when it comes to light sources in the background. The installed Intel Core i7-4500U CPU as well as the gigantic 12 GB of DDR3 RAM predestine Sony's big convertible for all thinkable tasks. Only heavily parallelized applications, such as a few games, and the 3D rendering software 3ds Max, clearly benefit from four or more physical cores. Other manufacturers manage to retrieve more power from the same CPU. For example, Dell's Inspiron 15 3537 (Polish review) has a 25% lead on the review sample in the multi-core benchmark of Cinebench 11.5. Both cores in Sony's device clock with 2.7 GHz at the start of the benchmark, but the clock drops to 2.4 to 2.5 GHz the higher the temperature climbs. Though this is not ideal, the behavior is observed in most CPU combinations. We did not ascertain any performance differences in battery mode. In the reviewer's opinion, the system's performance is close to perfect. However, it was occasionally noticed that the system does not sport a genuine SSD. System starts benefit greatly from the SSD cache. The speed of the review sample would never be matched with a sole, conventional HDD. The reason for Sony's 20% lower PCMark 7 total score in the field is most likely due to its slower storage device. 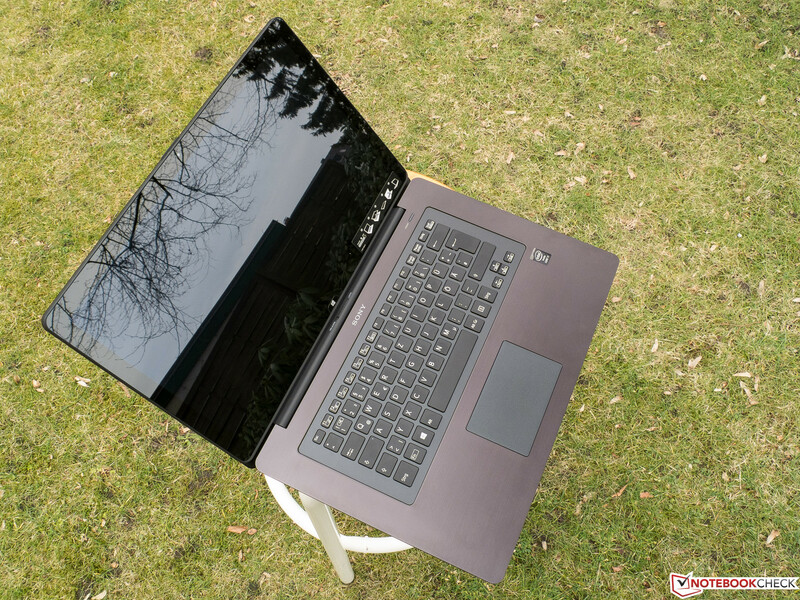 The performance is within the expected range compared with laptops with a similar configuration. While both the Asus Taichi 31 and Lenovo Yoga 2 Pro rely on genuine SSDs, our Sony has to live with a conventional hard drive (Western Digital WDC WD10S12X-55JTET0). However, it is supported by a 16 GB SSD cache. The underlying idea is that the system stores copies of frequently used files in the cache, and thus can load them faster than from the HDD. This can lead to both swifter operating system and program starts after a learning period. By the way, this effect is responsible for the much higher read speeds in the second run of CrystalDiskMark 3.0 (right screenshot). The performance of a pure SSD, however, is rarely achieved. 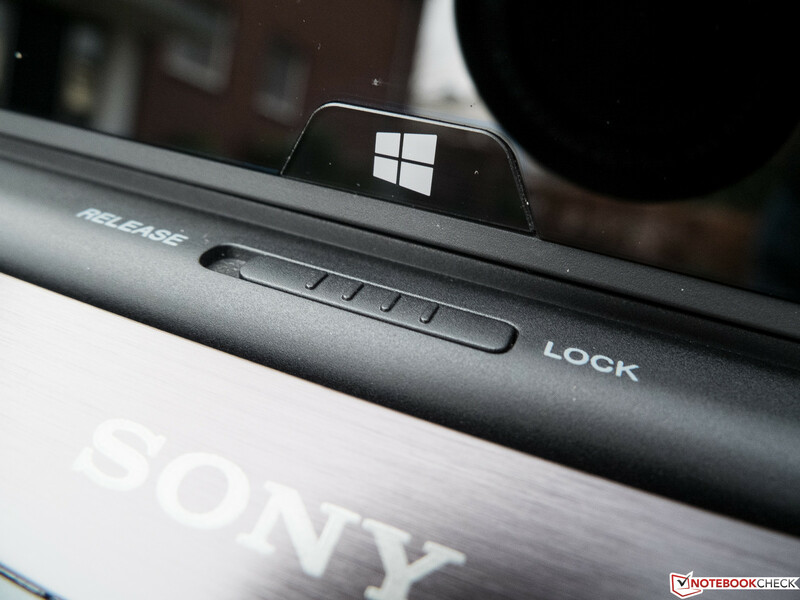 Sony's convertible accordingly lags far behind its contenders. The greatest difference is naturally found in reading small, randomly distributed data blocks (4K), where SSDs can excel with lightening fast access times because they lack mechanical parts. The now almost year old Nvidia GeForce GT 735M is a mid-range graphics card that supports DirectX11, and which is built in the 28 nm process. Specified with a maximum clock of 889 MHz, Sony has likely opted for limiting it to only 628 MHz for thermal reasons. The GT 735M is based on the GK208 chip, whose memory bus is limited to 64-bits, unlike the GK107 that is, for example, used in the GeForce GT 730M or older units of the GT 740M. The 3DMark (2013) scores confused us thoroughly. Several runs, performed under the same conditions, sometimes presented extremely deviating scores. For example, the figures of the Ice Storm Standard scores with a bandwidth ranging from 26425 to 18712 points. Since we could not selectively reproduce especially high or low scores, the only explanation is that the clock rate of the CPU and/or GPU dropped randomly during load. The chart below shows the average scores. We do not see a reliable data basis for a qualified comparison of the two competing devices, and thus would refer to the gaming benchmarks scores that are more real-life anyway. The GT 735M's performance is on the expected level when looking at 3DMark 11, which we only performed once. 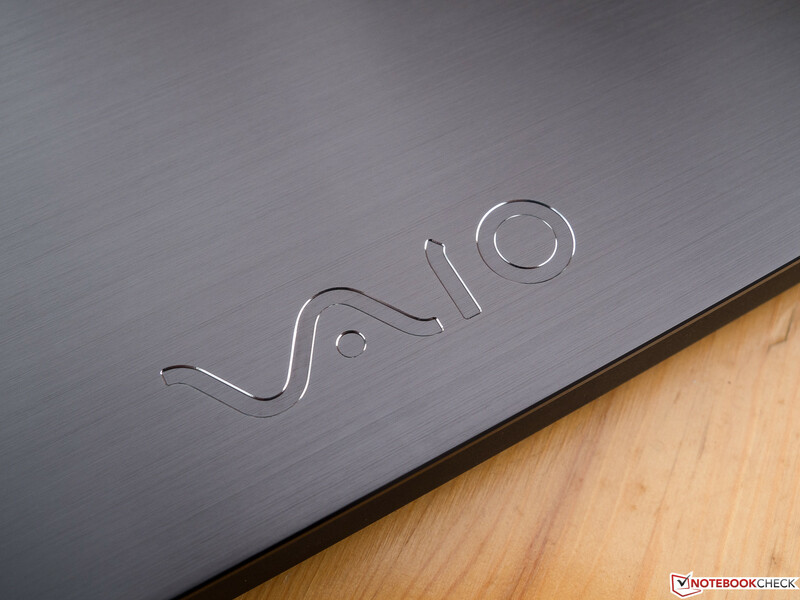 Many current and graphically demanding games are smoothly playable on Sony's Vaio Fit multi-flip SV-F15N1Z2E/B when the settings are limited to low or medium. This is not true for the Asus and Sony comparison laptops, which have to manage with CPU-integrated graphics cores without a dedicated memory. However, we could not even start Battlefield 4. A benchmark list of many mobile graphics cards and details about the used games can be found in our FAQ section. It is not quite clear when or why the review sample's fan starts up or continues to spin. In any case, just a little load, like watching a YouTube video (capacity 15 to 20%), is enough to set the fan blades in action very audibly. The noise produced in the two lowest fan levels, which are usually skipped from the outset, is still acceptable. The tiny fan likely has a considerable annoyance potential at faster speeds. Luckily, side noises like squealing do not turn up. In addition to the difficult to reach ports, we deem this permanent noise production the review sample's biggest drawback. We first have to note in this section that we measure the temperatures on the base's upper and underside. Only the rates of the underside are relevant in tablet mode. As can be seen in the graph, the idle temperature is absolutely no issue. The area of the display's hinge heats up to a still agreeable temperature during maximum load, which will hardly ever be achieved in practical use. The following frequencies were recorded in the load test: Prime95 only: 2 x 2.3 GHz, Prime95 + FurMark: 2 x 1.8 GHz. 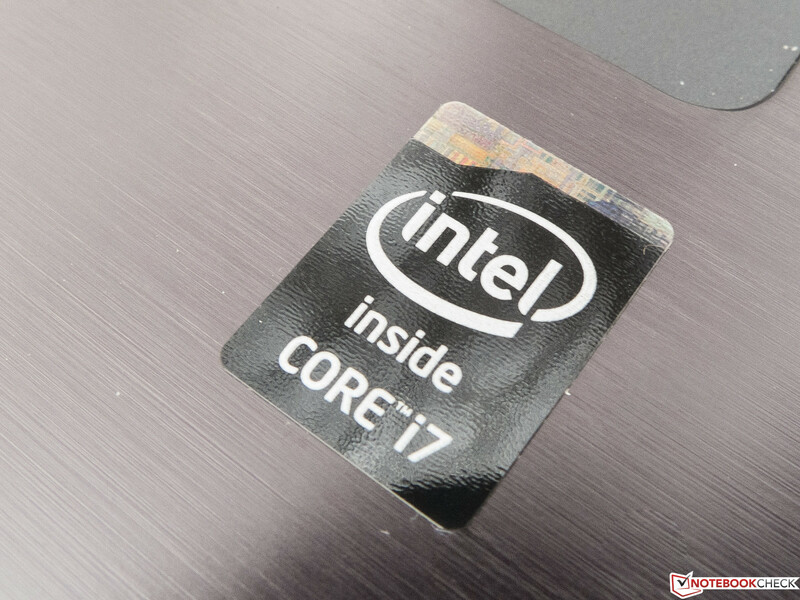 Thus, Intel's Core i7-4500U remains below the specified clock rates at a core temperature of always-below 80 °C (26.7 °F). 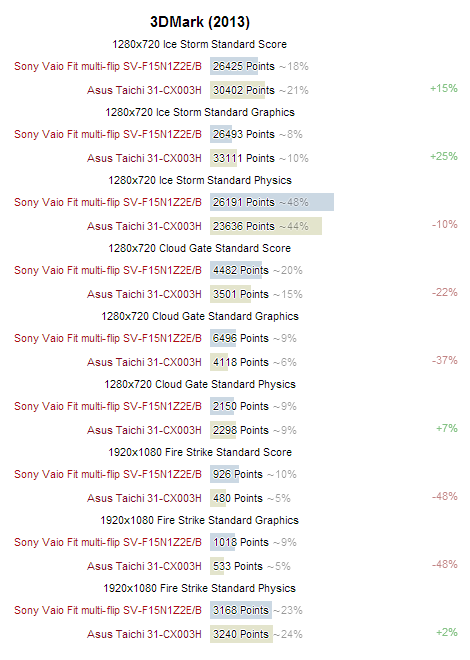 Sony does not quite have the temperatures under control; the performance level is below the CPU's potential in some places. However, this should only have an impact on software, such as demanding games that put the CPU and GPU under long-lasting, high load, in practical use. (+) In idle usage, the average temperature for the upper side is 28.2 °C / 83 F, compared to the device average of 30.3 °C / 87 F.
(±) The average temperature of the palmrest area of similar devices was 29 °C / 84.2 F (+0.3 °C / 0.5 F). The review sample's sound deserves the name, and is in line with the high price. Distortions rarely occur even at maximum volume due to good design. This phenomenon depends on the source. We did not notice any annoying volume fluctuations. 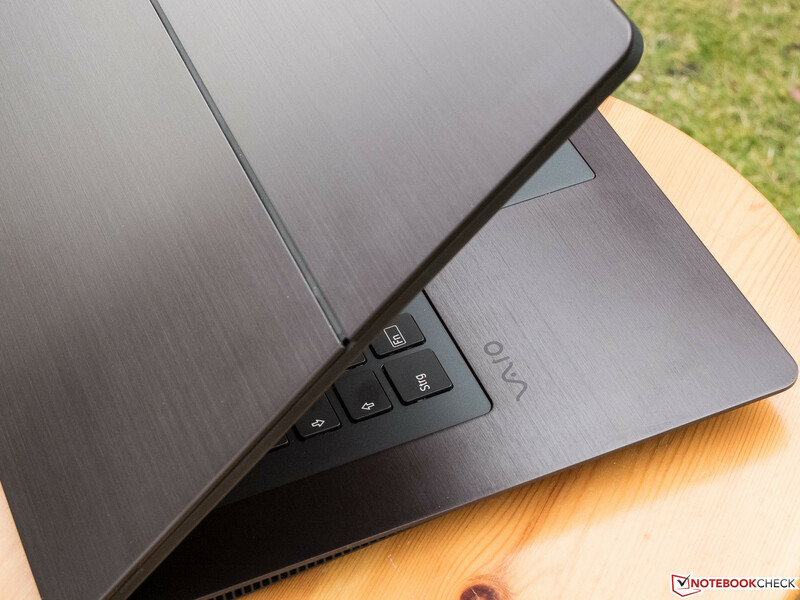 The well-balanced sound is crisp and differentiated for a laptop, and even has a hint of surround in the pre-configured settings. The balance tends to become even clearer when the device is placed on a table. We had a few acoustic problems in locating the speakers and the direction they radiate. Sony once again lives up to its reputation as a hi-fi pioneer, and can compete with Beats Audio as installed in the recently tested HP Spectre 13-3010eg. This is also true for music enjoyment via the home stereo system providing any sound tweaks are disabled beforehand. 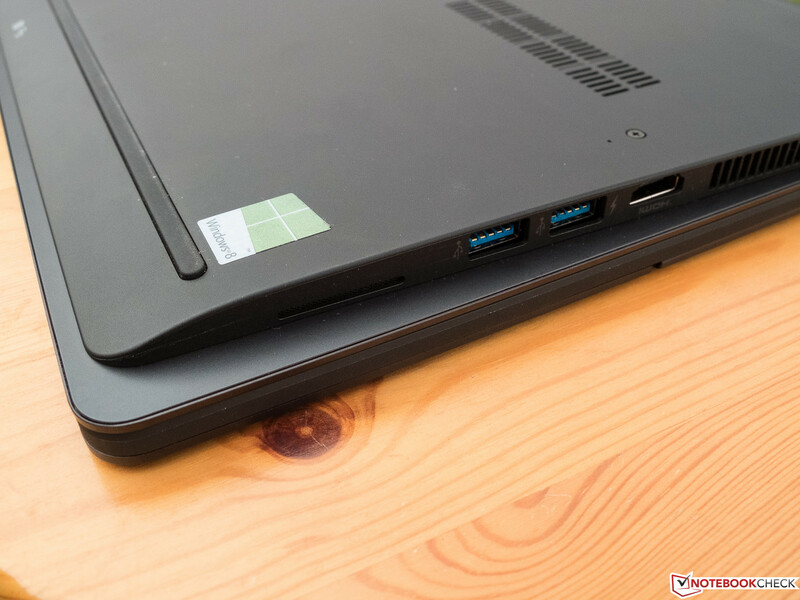 We compared the review sample with current 15.6-inch laptops to categorize its power consumption. Convertibles in this size are still rare. 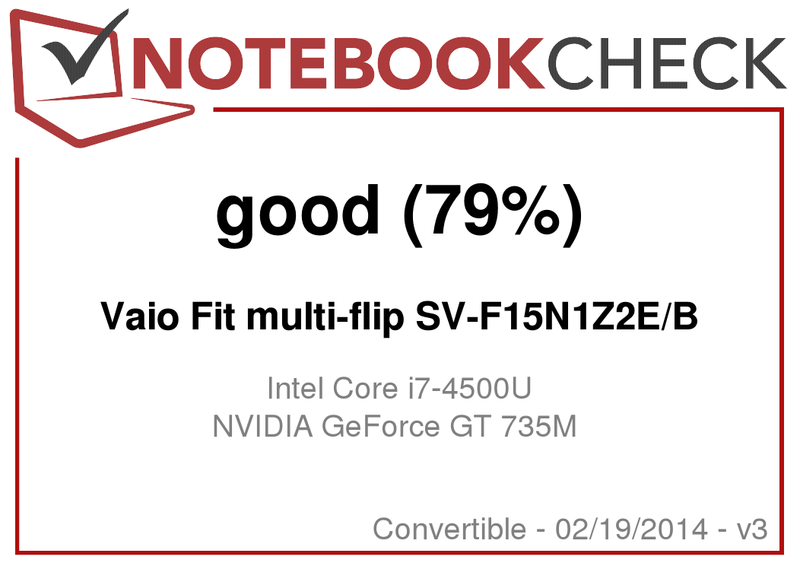 Sony's Vaio Fit multi-flip SV-F15N1Z2E/B unfortunately consumed power when turned off, though extremely little. The standby power consumption of 0.3 Watts is in the midfield, just like in idle mode (average). In the different load tests, the initial power consumption of 59 Watts sometimes dropped to 40 Watts within a short time, which might indicate throttling. Taking 40 Watts in medium load for granted, Sony's convertible is at the end of the upper third of comparable devices. The maximum, consistent consumption that we ascertained was 46 Watts - thus, the 65 W power supply has enough reserves to recharge the battery during use. 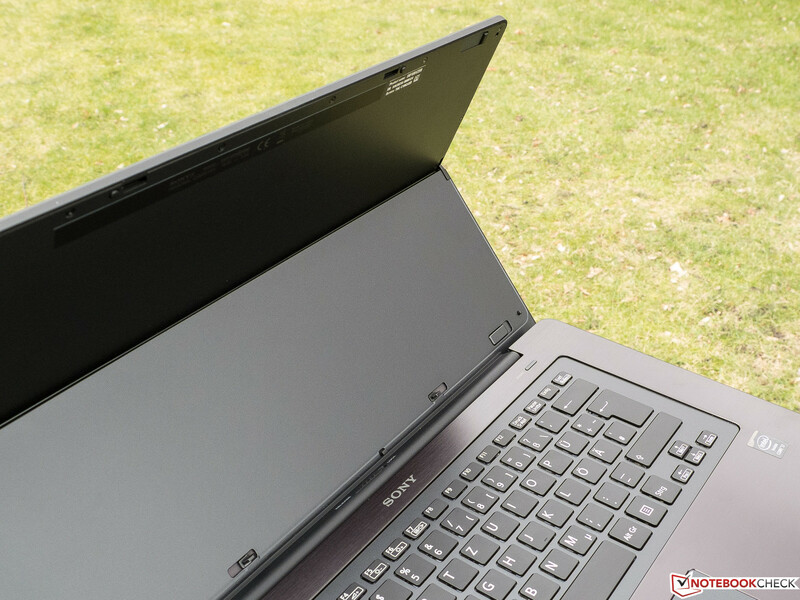 Compared with other current 15-inch laptops, the battery runtime was a bit below average in the practical Wi-Fi test, using a brightness reduced to 128 cd/m² and enabled energy-savings profile. However, almost five hours should suffice for most purposes. Our Yoga 2 Pro stood out by 21% with five and a half hours and has a marginal lead on its two contenders in the load test. The Asus laptop came in last with still over four hours. 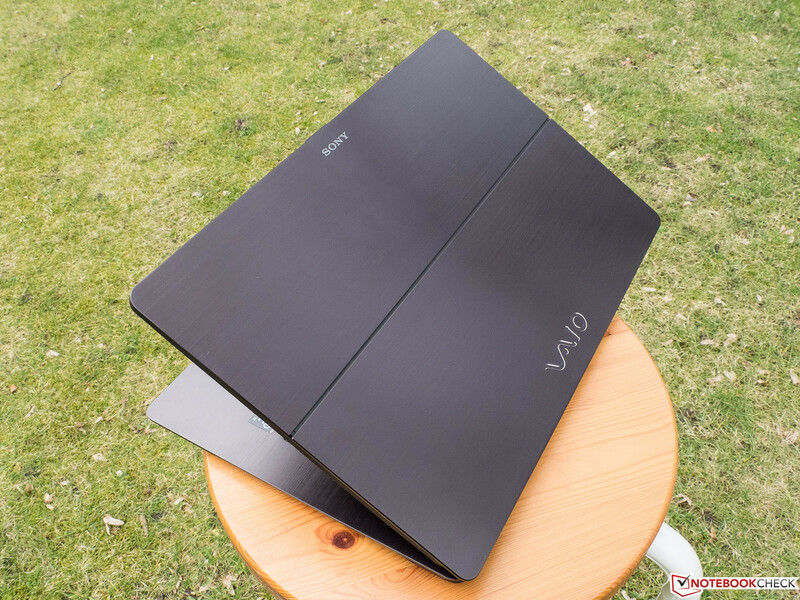 Despite the application scenarios mentioned in the intro, Sony's Vaio Fit multi-flip SV-F15N1Z2E/B remains to be an unusual hybrid consisting of a large laptop, and a too big and too heavy tablet for portable use. 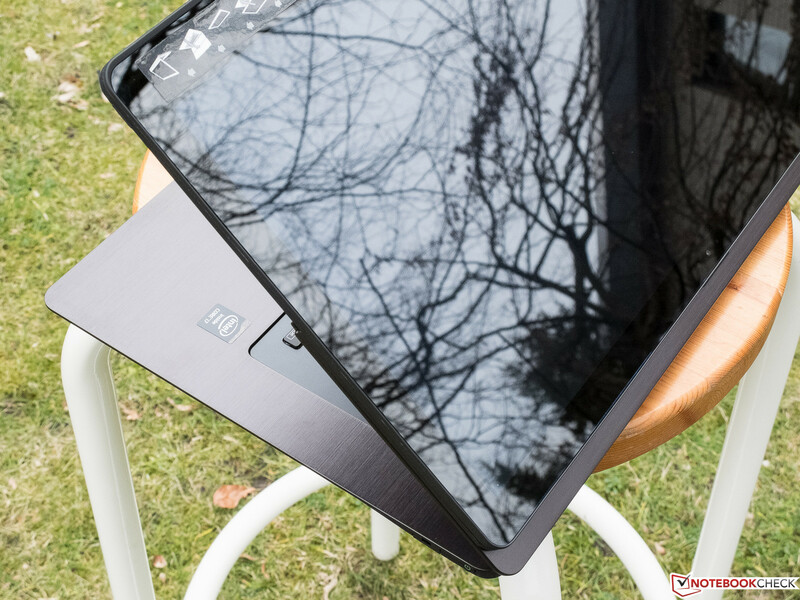 The device is something for special needs, and still mostly stands alone in its niche because other manufacturers like Asus and Lenovo only offer similar concepts with a maximum screen size of 14 inches. 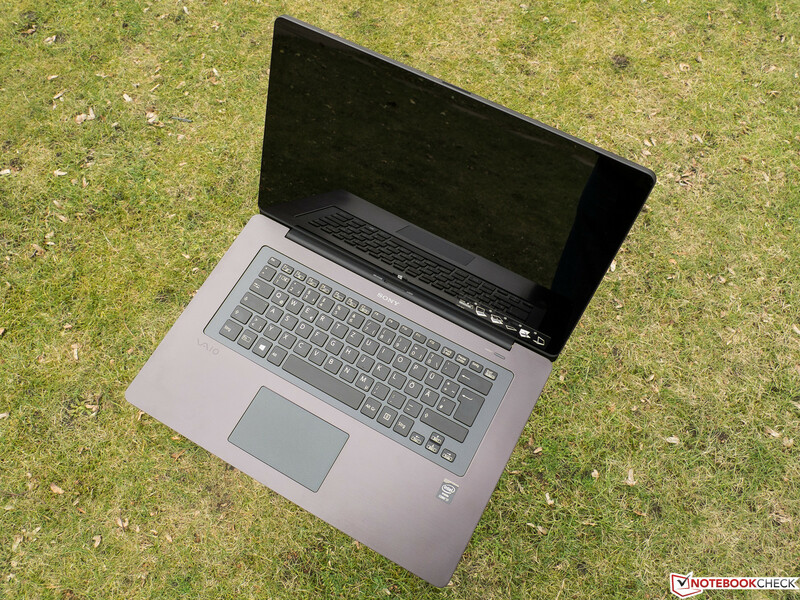 We should keep in mind that although both competitors offer slightly higher mobility (1.4 kg and 1.55 kg for the Lenovo and Asus models, respectively) (3.1 and 3.4 pounds respectively), their weight differences become marginal compared to the Sony after prolonged use. One highlight is, of course, the IPS touchscreen's extremely high resolution that virtually makes an update to Windows 8.1 seem mandatory. Its performance in routine use is also impeccable although a genuine SSD would have looked good in Sony's device considering the steep price. The input devices are satisfactory to good, which is also not in line with the device's price range. Unique, in a negative sense, is the unfortunate design with the base's protruding upper side, which makes accessing the ports absolutely and unnecessarily difficult. 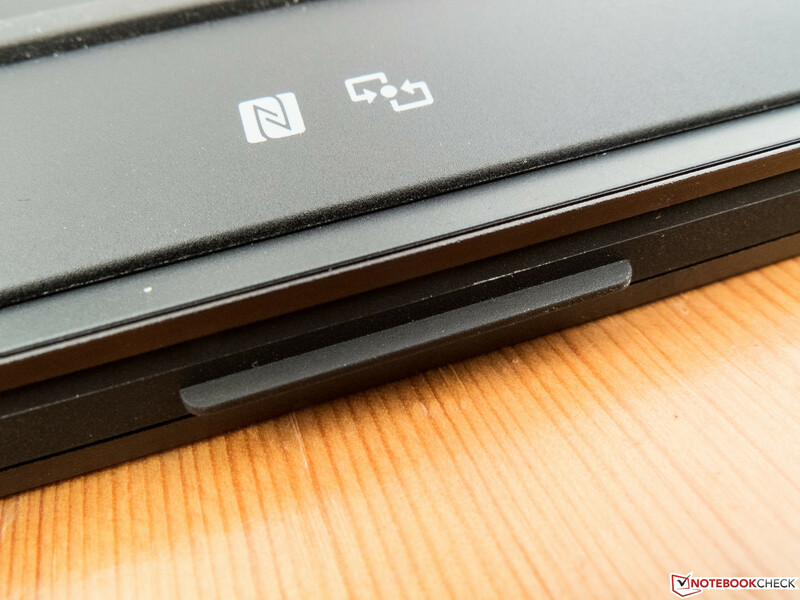 The flip mechanism is a clever idea, and superior to both Lenovo's and Asus' design in the author's opinion. 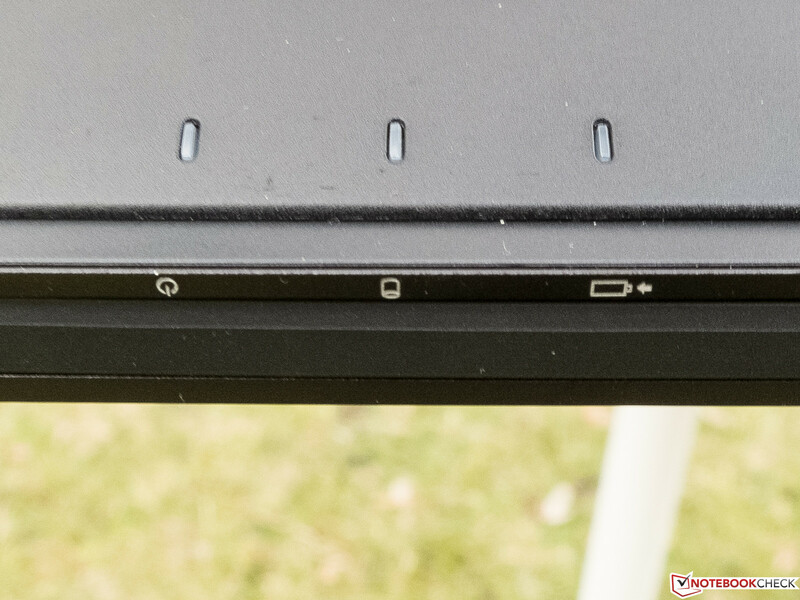 The user always presses around on the lower (locked) Yoga 2 Pro's keyboard in tablet mode, and some potential buyers will have difficulties getting used to that. The two screens of the Taichi consume more power, and it rules out the protective clamshell effect for transportation because one screen is always on the outside. The slower CPUs, compared with the review sample, will only make a difference when using very performance devouring software; this is countered by the installed SSDs. 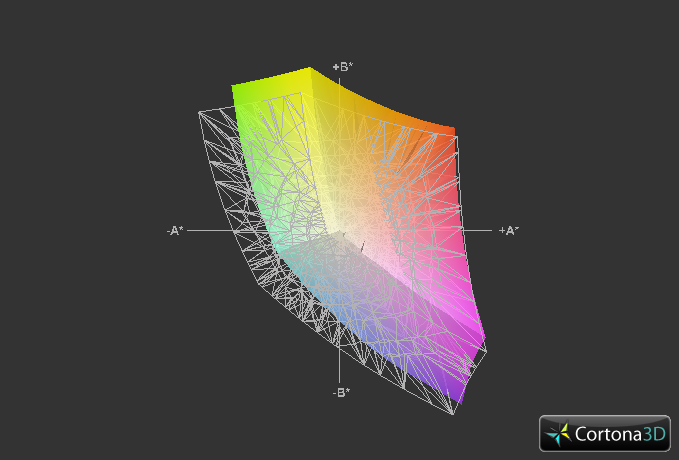 ...and changes depending on the ambient light. ...who is currently breaking with its computer and TV divisions. ...always make sure that the flip mechanism is locked. ...the intense reflections on the screen right away. The maximum opening angle of approx. 130° cannot be criticized here. The base's upper side protrudes, and covers the ports. ...can be marveled at in its full glory. Not very clever: The status LEDs are on the underside. With some luck, their reflection might be seen on the table. ...did not convince us despite the standard layout. The touchpad could be a bit bigger, but is satisfactory otherwise. 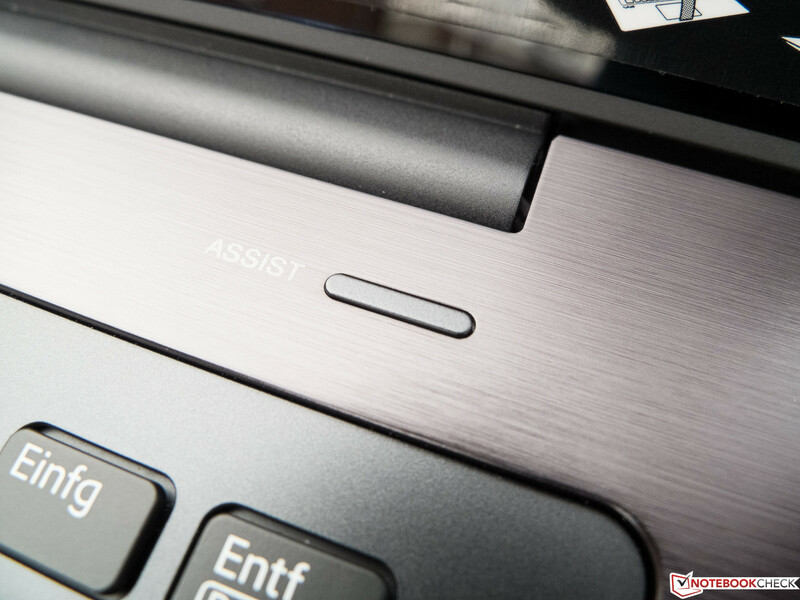 "Assist" refers to the second, easier to reach on/off button. ..the warranty doesn't matter, and the user grabs the screwdriver. The rubber stoppers are unusually high. NFC devices are placed on this label. The screen renders up-scaled 1080p videos brilliantly. The performance is impeccable in routine use. The price does not allow for a decent keyboard?